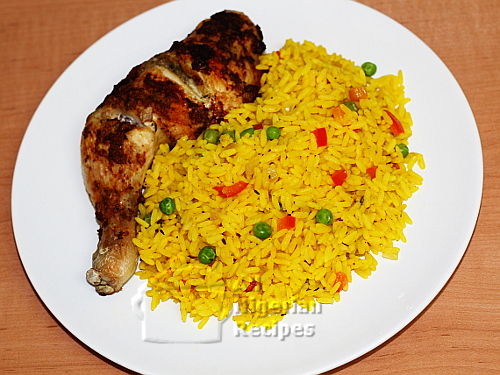 Turmeric Rice is one of the most basic yet delicious rice recipes to prepare in your kitchen. There's no tomato stew to make in this recipe so what can stop you from preparing this rice dish? If you are in the USA/UK, use 2 cups. If you are in Nigeria, use ½ De Rica cup. If you have a weighing scale, use 350g or 0.8lbs. 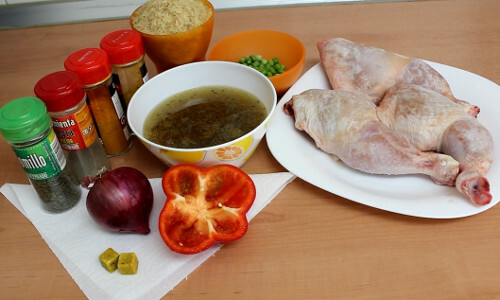 This following image shows the quantities of some of the ingredients used. Use enough turmeric powder to colour the rice. Please note that the rice may not look so yellow when you add the parboiled rice to the turmeric mix in the pot but when the rice is done, it will become very yellow. Turmeric is known as yellow ginger in Nigeria. It is known as ajo or ata ile pupa in Yoruba and kurkum in Hausa. You can buy turmeric powder in big supermarkets eg Shoprite in Nigeria. I used chicken stock for this recipe because I served the rice with Onion Baked Chicken. I used soft chicken which I baked from raw so no boiling of the chicken done to get some chicken stock. This means that for taste, I added chicken stock which I always have in my freezer. I get this chicken stock when I prepare side dishes like Peppered Chicken. If you want to prepare this with Fried Chicken or Grilled Chicken, cook the chicken with thyme, onions, stock cubes and whatever else you use to season your chicken. Then add the water from cooking that chicken (chicken stock) to the rice during Step 1 in the cooking directions. If you are in Nigeria, red bell peppers are available in big foreign supermarkets. Use tatashe as alternative to the red pepper. The quantity of red pepper you need is so small, see the video below. Rinse, remove the seeds and cut the red pepper into small pieces. Prepare the chicken you will serve it with. You can serve with Peppered Chicken or Onion Baked Chicken. Parboil the long grain parboiled rice. 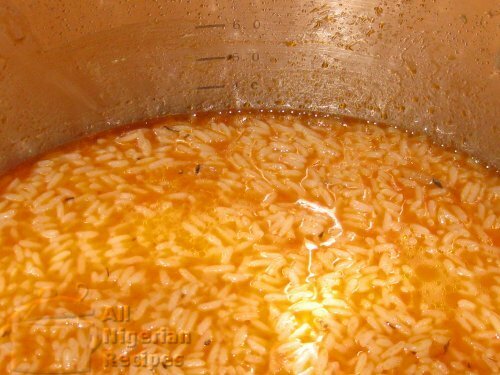 For the quantity of rice stated above, add to boiling water, stir, cover the pot and once it boils again, leave to boil for 10 minutes or till you can easily cut the grain of rice with your finger nails. For meat, serve with Peppered Chicken or Onion Baked Chicken. For side dishes, serve with Fried Plantain, Nigerian Moi Moi, Nigerian Salad or Coleslaw. Click here to send me your feedback and questions about preparing this Turmeric Rice.